Do you want your smile to be your ‘crowning glory’? When teeth are decayed, cracked, stained or chipped, they may detract from an otherwise beautiful smile. To restore your dental health and appearance, a porcelain crown, inlay or onlay may be the perfect option for you. A crown is a restoration that covers, or caps, a tooth entirely to restore it to a healthy shape and size. Its purpose is to strengthen or improve the appearance of a tooth, particularly when a normal filling is not quite big enough to restore the tooth. Porcelain crowns are strong, long-lasting and they look very natural. Virtually indistinguishable from your natural teeth, crowns restore function and can help to aesthetically enhance your smile. Traditionally, crowns were made with a metal framework for strength which is then covered over by porcelain. Although this has proven to be very durable, the appearance is not always quite as natural as you would like due to the metal in the crown. 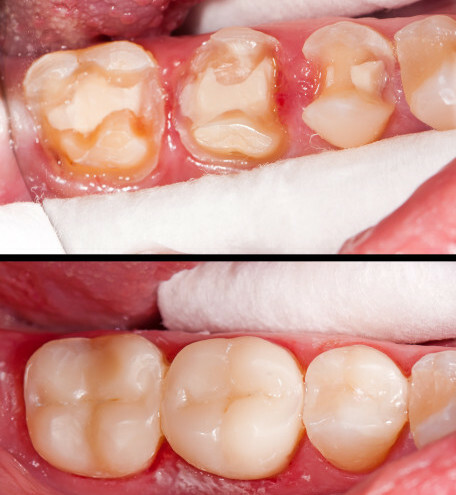 Up until recently, ‘all porcelain’ crowns (with no metal strengthening) have been a little weak and prone to breaking. This has now changed with the advent of new porcelain technology. 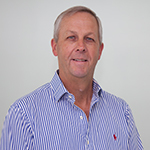 Here with Dr Mark Dennes in Macquarie Street, Sydney we are able to offer you beautiful, all-porcelain crowns which are extremely strong and durable. The ‘eMax’ crowns used in our practice are clinically proven to be a long lasting restoration for patients while still appearing as a natural tooth. Dental inlays and onlays are ‘partial crowns’ which are used on back teeth (molars and premolars). Inlays and onlays are used when the tooth needs more than an ordinary filling, but doesn’t need to be fully covered by a crown. When designing your restoration, a number of factors are considered such as the colour, occlusion (bite), shape and length of both your natural teeth and the artificial restoration. Any one of these factors alone can significantly affect your appearance and dental health. A number of different materials can be used to produce a crown, inlay or onlay and these will be discussed with you at the time of treatment planning. If you have a certain look in mind for your crown, discuss it with us at your initial appointment. When the procedure is complete, your teeth may not only be stronger but they may transform your smile and facial appearance. The patient had a fractured cusp on her second premolar which required a crown. The patient had good dental health, but had suffered antibiotic staining of her teeth as a child. She was not concerned about the colour of the teeth, and so the new crown was blended to the existing colour of the natural teeth. The above photo shows the completed case. Tooth ‘1’ shows an ‘old’ style crown placed many years ago. The crown has underlying metal with porcelain fused over the top to try to make it look like a ‘real’ tooth. It’s easy to observe that the aesthetics of this crown are fairly poor. The porcelain is quite opaque, and the underlying metal produces an unsightly ‘shadow’ effect at the gum line. Tooth ‘2’ is the newly fitted ‘Emax’ all-porcelain crown. 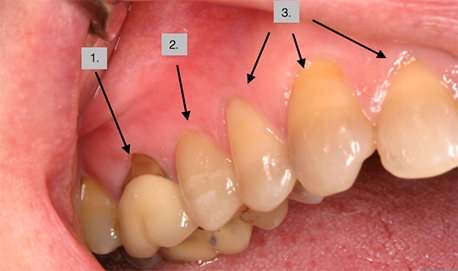 It is indistinguishable from the patient’s natural teeth (labelled ‘3’). The ‘Emax’ crowns have no metal and mimic the colour and translucency of natural teeth superbly, as well as being very strong and long lasting. This is the type of crown we use in most cases today – especially where aesthetics are critical. Our friendly and knowledgeable team will be happy to answer any questions you may have regarding the different restorative treatments. Available now with Dr Mark Dennes located on Macquarie Street near Martin Place Station in the Sydney CBD. For more information, please call (02) 9221 1685 or make an enquiry online today.